OrganizationForward® is a full stack solution for talent review and deployment needs. Because OrganizationForward® is web-based your team has access to the information in real time. The applications within OrganizationForward® support your hiring, strategic planning, employee engagement, talent review and development efforts. SOLVE uses a comprehensive approach to our engagement with your company. By looking at the whole of your organization we are able to deliver a solution that benefits all segments of your company. DestinationForward® allows your team(s) to view and update strategic activities through a single portal. Because you have access to dashboards and other data the team is up to date at all times. No more wasted effort wondering what actions are outstanding and what items are completed. DestinationForward® also gives your team real time updates on completed deadlines. To learn more about how DestinationForward® can help your team achieve more Contact Us. 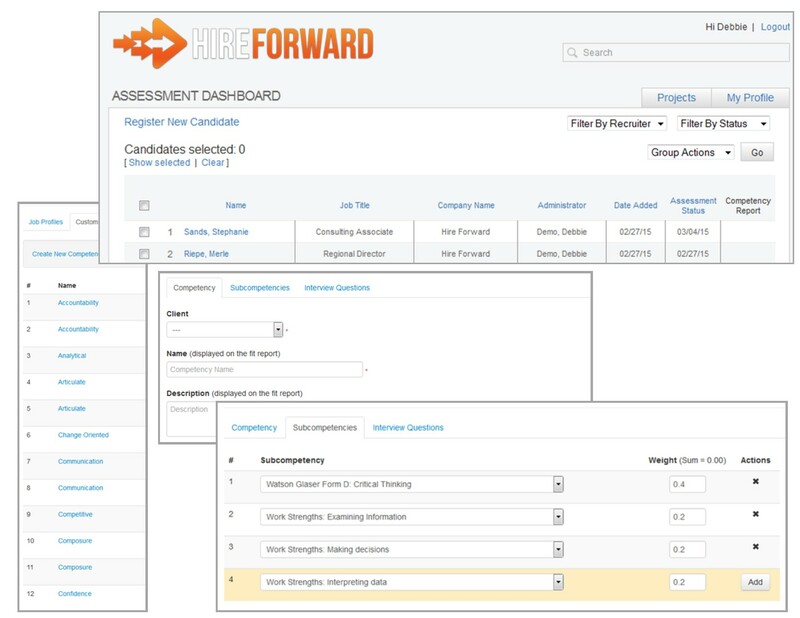 HireForward™ is a web-based assessment platform that allows for customization of popular and valid assessment tools. This system allows each profile to be created based on the unique requirements of the role and the characteristics that are successful in your organization’s work environment. HireForward allows your hiring managers to compare candidates among your best employees. Our system allows multiple administrator levels, integration into most HRIS systems, and provides immediate results. There is no need to wait on a person for in-depth analysis. Our three-step process has increased the success of hiring the right candidate in multiple industries and professional roles. We review your current selection process and procedures, along with your organizational documents for the role to determine accuracy and appropriateness in selecting candidates for the role. This includes an evaluation of the job description. We also interview key stakeholders from human resources, managers and recent, high-performers in the role to better understand the process and to determine and quantify critical selection criteria. As a result of our interviews with key stakeholders, we identify the ideal characteristics for success in the role. In addition, we identify other important cultural characteristics, which can also have an impact on success. This includes the level of team orientation, the level of appropriate social interaction (heads down versus collaborative environment) and expectations in decision making (independent versus collaborative). Clarity about work environment expectations helps in the creation of an effective selection process that will increase retention of high performers. The final step in the process involves us evaluating the top performers using valid assessments to determine the meaningfulness of each valuation in predicting performance. This study provides support for the framework of traits identified as critical for success in the role and ensures your organization is in compliance with the EEOC. The power of effective action planning and the positive impact it has on employee engagement is impressive. In our research, companies who actively manage action items based on employee feedback achieve significant increases in year-over-year employee engagement scores. EngagementForward® prioritizes action planning by placing it front and center. The Dashboard provides managers with their task list and their progress compared to their team and the company overall. The Dashboard also notifies managers of important events. Managers can also track the progress of their direct reports to support accountability across engagement initiatives. EngagementForward provides more than action-planning assistance, it also provides easy access to survey results. The survey information is used for analysis and provides a baseline to create action plans to help clients improve upon identified problem areas. 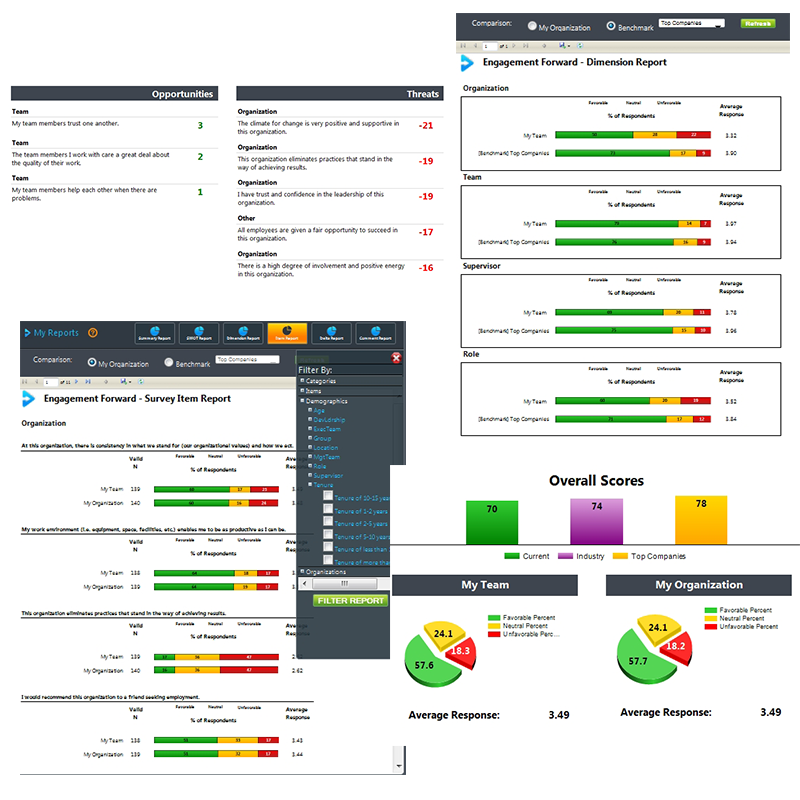 EngagementForward includes a set of defined reports that provide clients with insight over various areas of interest, including comparisons to industry and highly engaged company benchmarks. EngagementForward has several security features to ensure the confidentiality and anonymity of data, including role-based security, encrypted credentials, SSL enabled and anti-forgery. To learn more about how we can SOLVE your business challenges, call 402.934.0085 in Omaha, NE or 480.563.2615 in Scottsdale, AZ.